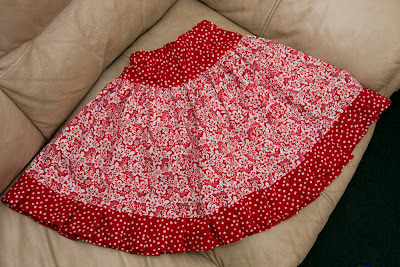 Here is my last skirt for Miss C for a while. I cut this out more than a month ago, but finally got around to sewing it last week. I ended up making it quite big--it's about 18 inches in length. I plan on her wearing it next year when she is taller. She really doesn't need a new skirt right now. This skirt is simpler than the previous ones I made (very minimal piecing). The main body of the skirt is 12 inches long. 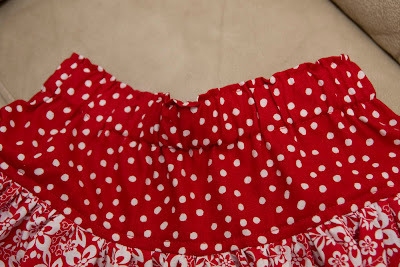 The hem is 2 1/2 inches and the waist is 3 3/4 inches. The width of the floral fabric is 80 inches (two strips of fabric cut edge to edge and sewn together). 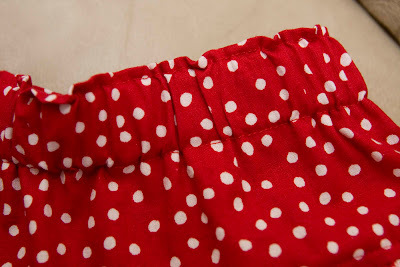 The hem is 160, twice the skirt (four strips of fabric cut edge to edge). I added pleats to the hem this time. I divided the skirt and the hem into 1/8s then pinned them together. 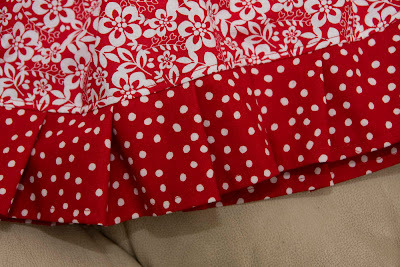 I pinned the pleats in each individual section (about 6 pleats per section). I didn't measure and wasn't exact, but it was close enough. It turned out really cute. Lately, I have been adding one extra detail on the waistband. I sew an extra seam about 1/8 inch from the top. It adds a puckered look to the waist. I think it gives it a bit more finished look. A little girl can definitely have too many skirts. Miss C and Miss A's closets are filling up with lots of cute skirts. I decided I need to move on to a new project fad. As I am still addicted to shopping for and buying fabric, I decided my newest fad needs to be fabric related. I started looking at quilting sites yesterday, and it really made me want to make a quilt. I haven't made a quilt in years. The problem is I hate hand quilting. It is probably one of my least favorite crafting activity that exists. It even beats out crochet which I despise because I have tried many times and just can't do it. Some things just aren't made for left-handed people. I realized I have a darning foot for my sewing machine, and I can actually do this on my machine. I felt a little silly. I have all these accessories to my machine, but have no idea what to do with them. I was really excited. I watched a few more u-tube videos to learn more and then decided to jump right it. A while back I bought some sheets for Miss C, but didn't need the fitted sheets so I decided to cut off the edges and make a simple quilt with them. It has been sitting in the corner, basted together for months. I just didn't want to face quilting it. I even thought about just throwing it away and giving up. What a perfect project to practice free motion quilting on! Miss C could care less how the quilting looks, and it's all ready to go. I really had fun trying. I ran out of thread about 2/3's of the way through so I'm not quite finished. I decided I definitely need quilting gloves as it's hard to hold the fabric and quilt smoothly. Other than that, I just need more practice. I spent about an hour this afternoon working on the quilt and feel a lot more comfortable doing it already. It's just tricky to move smoothly at a consistent speed. My next project is a quilt for Little D with the dinosaur fabric I bought a while back. I'm onto my new project fad. You can always use a few more quilts. I started making my sketches right away (which I will post soon once I redraw them to be legible). I also checked Joann's, and they had felt for $2.99 a yard. I went over there the same afternoon and stocked up. This was honestly a very simple project, and I really had fun doing it. It took me about 2 1/2 hours to cut everything out and I sewed it all together during two different naps and one evening--probably about 6 hours total. I have more ideas to add, but figured I'd let Miss C play in it in the meantime. 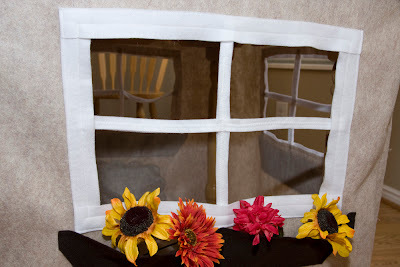 I plan to add a garden of flowers in front under the window as well as on one side. 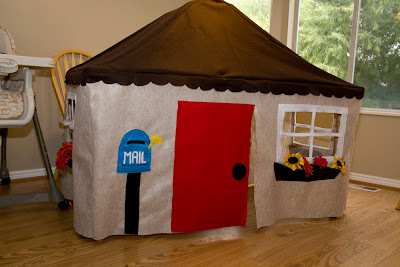 I will sew stems on the felt and then make felt flower that velcro onto the house. 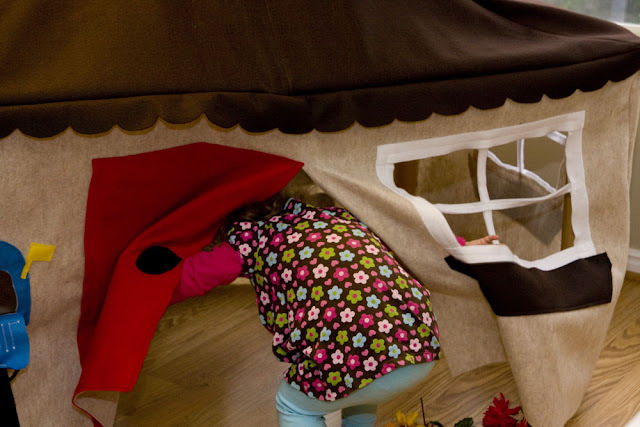 I also want to make a rug for it as well so she isn't playing on our dirty floor. 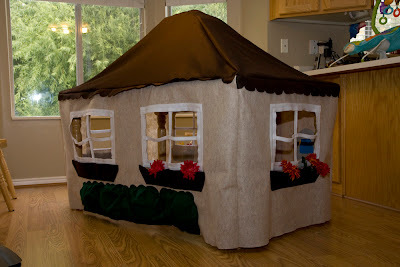 I just used a cut up diaper box to prop the roof. I need to find a bigger box and cut it more accurately, but this works for now. 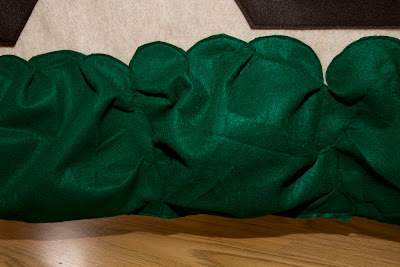 To make the bushes puff out a bit, I sewed small pleats around the edges and stuffed them with a few scraps of felt. 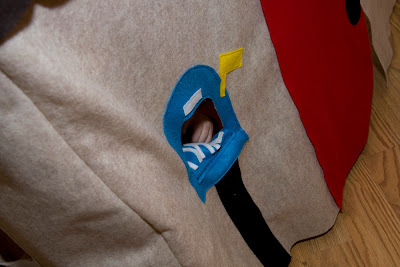 I sewed a seam up the middle of the window box, but will probably do a couple more seams. The flowers fall out too easily. 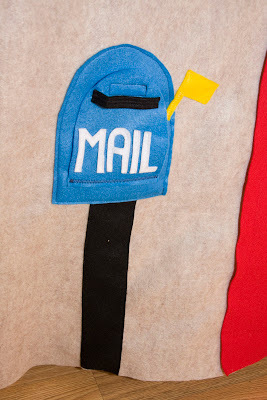 The mailbox was a hit. 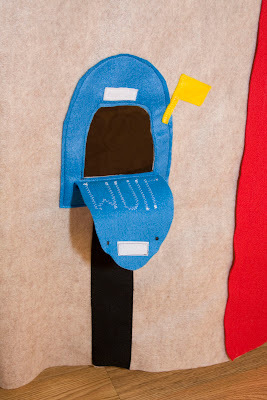 Here is Miss C demonstrating how the mailbox works. One negative is that I discovered that felt stretches a lot. Miss C has already stretched out the window panes of one window when she tried to climb in that way while I was inside her house. I can tell it's going to take a beating, but I think it was worth the work.